Mark V (Model 500) Magna America put this American classic 5-in-1 tool into production in 1953. Since its introduction the Mark V has gone through a series of important upgrades to improve its performance, working convenience and safety. 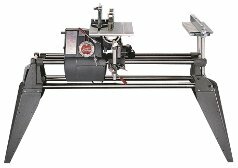 Today, any Shopsmith owner is able to add any or all of these upgrades to their older machines -- and do it themselves -- to bring their machine up to the latest standards. No other power tool that we know of offers this level of upgrade-ability! Mark Vs during this period were painted green. These units had a Gilmer Drive System (the inside of the top belt is like a tank track). These units were a single bearing spindle. 3/4 Hp motor was the standard. An information packet, including copies of parts lists, owners manuals and more, can be ordered Here. Brown / Gold / Tan / Anniversary Model machines produced during this period were painted tan/gold. An information packet, including copies of parts lists, owners manuals and more, can be ordered Here. 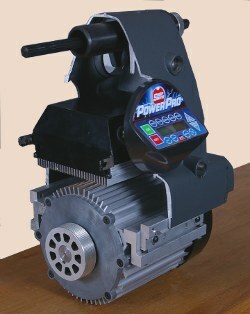 1960 - Poly-V Drive System (the inside of the top belt is a serpentine) introduced, delivering improved belt durability and reduced machine maintenance. 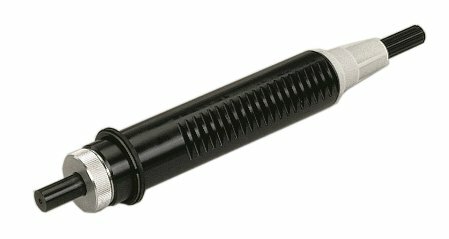 The more powerful 1-1/8 HP Motor was introduced. Your can upgrade from a 3/4 hp motor to the more powerful 1-1/8 hp motor. An information packet, including copies of parts lists, owners manuals and more, can be ordered Here. These were the next units to have the Poly V drive system. An information packet, including copies of parts lists, owners manuals and more, can be ordered Here. The Magna America Corporation relocated and the Mark V went out of production. 1972 -- Shopsmith, Inc. Formed -- Mark V is Back! In 1972, Shopsmith, Inc was formed and the Mark V was back! The Mark V now remains gray but now has a rougher splatter texture. 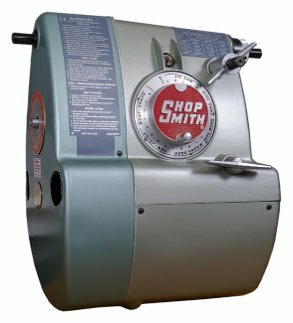 In October of 1984 (starting with serial number 190000), Shopsmith upgraded the drive system to the 2-Bearing Quill. 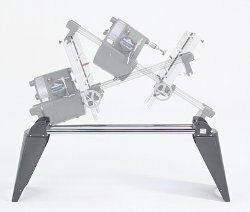 Older Poly-V Drive System Mark Vs can be Upgraded to the Two-Bearing Quill for greater stability with less runout and wobble. A Mark V information packet, including copies of parts lists, owners manuals and more, can be ordered Here. In 1985, the Mark V Model 510 was introduced with an improved, big 17-1/2" x 22" main table. The table system also includes two floating extension tables along with connecting tubes and telescoping legs to provide over 8 feet of table width. A new larger rip fence with t-tracks for mounting accessories and jigs. Other parts of the upgrade include a see-through upper saw guard (with riving knife and anti-kickback device), lower saw guard with 2-1/2" dust port and more. An Upgrade kit is available to add the larger, more expandable table and fence system to Model 500 Mark Vs. A Mark V Model 510 information packet, including copies of parts lists, owners manuals and more, can be ordered Here. 1991 Mark V Models were introduced with the “C” Headstock featuring a Red Safety Key Switch. In 1999 the Mark V Model 520 (with Pro Fence System was introduced. 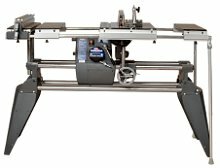 The Model 520 Pro Fence System features two interchangeable stainless steel scales for direct-reading of rip cut widths... plus... twin locking levers... one for the infeed end of the fence and another for the outfeed end to ensure a positive, precise fence lock-down, even when working with large and / or heavy workpieces. An upgrade kit for the Mark V Model 500, as well as an upgrade kit for the Mark V Model 510, is available to give these advantages to older machines. An information packet, including copies of parts lists, owners manuals and more, can be ordered Here. The Shopsmith Mark 7 adds two additional functions (shaping and routing) to become a 7 function machine and features an electronic speed-change mechanism making it one of the most revolutionary woodworking power tools available anywhere! The Shopsmith Mark 7 is powered by the revolutionary Shopsmith PowerPro Headstock. 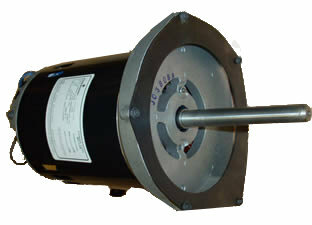 The PowerPro's DVR (Digital Variable Reluctance) motor features • More Power (1-3/4 hp at 120V and 2 hp at 240V) • 120V or 240V operation without any adjustments beyond switching the plug on the power cord • Reduced energy usage and emissions over conventional motors • Dual direction capability • Easy-to-use touchpad controls • Quieter operation • Reduced maintenance... and more! Click here to read more about the benefits the advanced Shopsmith PowerPro brings to the Mark 7 and about options for upgrading older Shopsmith machines. In addition to existing functions, the Mark 7 adds Double-Tilt to bring an under-table option to its Shaping and Routing capabilities. 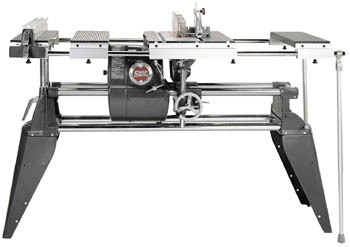 An upgrade is available to bring tilt-both-ways convenience to older Shopsmith Mark V machines. 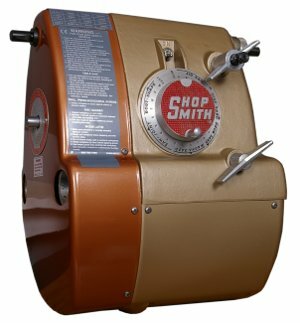 Information about other machines bearing the Shopsmith name (10E, 10ER, Mark II, Mark VII, and Sawsmith Radial Arm Saw is available here.